Haha, you remember the Ropana piece sketches? 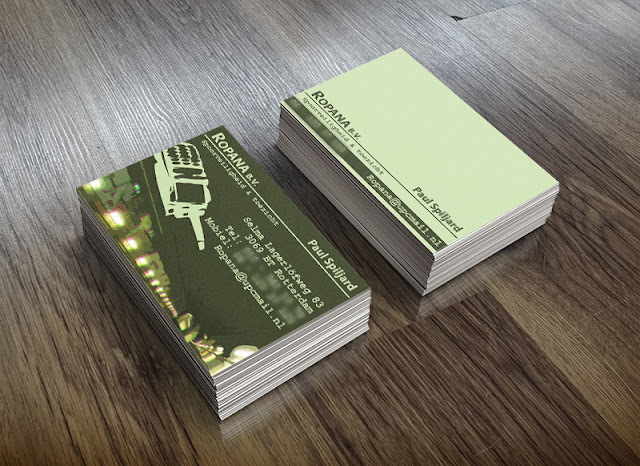 I did announce a businesscard design & restyle in that blogpost aswell, Paul asked me to do it.. And as it is a company that has to keep the safety near the metrorails when there is maintenance work to do, you never know when they're working; I got a couple of months for finetuning before I could speak properly to my client and then.. My order was placed at DrukwerkDeal haha. My design was 1000 times thought but without the help of DrukwerkDeal it wouldn't have came out too well! I really liked the way of ordering (when uploading a file they test it for you on crop marks, cmyk colours, overset text and more!) and my 200 business cards were here in 2 days! So back to the subject: I got a old business card from him with the message he 'wanted something new'. I am getting more and more familiar with printing methods and things that are essential when designing, so when I got the card it was a bit of a laugh. So the restyle was more dark, because they often work in the night and the tunnels is what the subway is famous for. Also made an illustration of a typical 'Walki Talki'; They use them to contact the subway company when there are problems, or they want to ask a question about the status of the railway tunnel they're working on. Nice and full of info. The back was more empty, the greenish tints are used again but in a negative way.. Also the key info elements are added at the bottom. A nice new touch for Ropana! Thanks to GraphicBurger for providing this mockup!